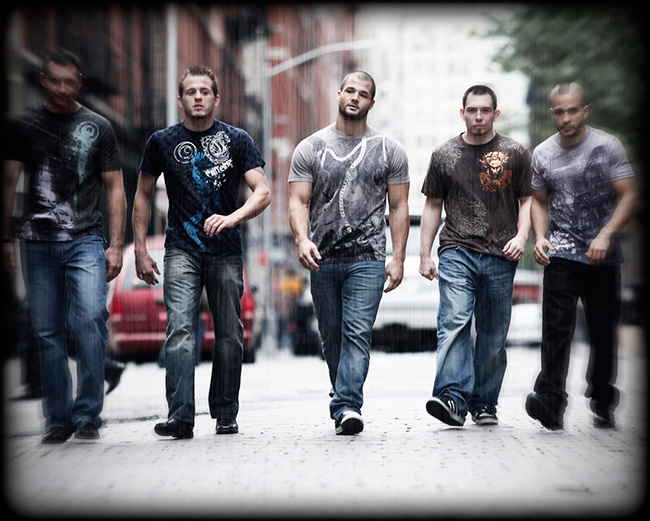 I loathe MMA T-shirts every bit as much as I love the sport they supposedly represent. I’ve never quite understood how fighting, a culture based on discipline and singular focus, came to inspire such aesthetic disorder and random skull/dragon/axe/chain placement. And yet this look has thrived since the early 2000s. 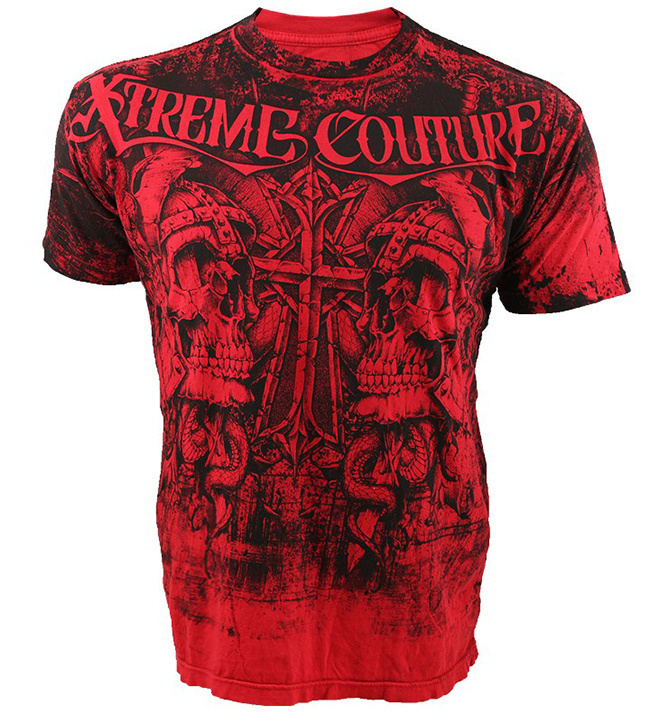 In MMA, you’re clearly no one until Affliction, TapOut, Bad Boy, Xtreme Couture, or some plucky upstart has designed a shirt for you that looks like something Gwar threw up after eating Smaug the dragon. I’m far from an expert on the visual arts, though, and my own sartorial history is far too littered with T-shirt demons (90s band merch and 00s pro-wrestling gear) to allow me any authority on this subject. So I decided to consult three experts from the art world and get their professional perspectives on MMA’s unique contributions to their world. I sent these experts 10 recent T-shirt designs and asked them to evaluate the shirts as if they were works of art. This is what happened. Sam Chou is an award-winning animation filmmaker and director. He’s worked on TV series, commercials, documentaries, features films and, most recently, the web. His most recent creation is CRIME: The Animated Series, which screened at the Toronto International Film Festival this year. He also has a background in Brazilian jiu-jitsu and Muay Thai. Dimitri Gagnon Morris is an animator and Motion Graphics Artist and a Metalsmith/Goldsmith. Although he some background in martial arts (a Red Sash in Wing Chun King Fu and some Shaolin Kung Fu), he would like to clarify that he knows nothing about MMA and its fighters. Suzanne Carte is an independent curator and critical art writer. Currently, she works as the assistant curator at the Art Gallery of York University (AGYU), focusing on an integrative model for utilizing public programming as a pedagogical tool within the academy. Suzanne recently got her Masters of Contemporary Art from the Sotheby’s Art Institute in New York City. She has trained with Emilio Garcia’s Combative Fighting Systems in New York and is currently working out of Toronto NoGi studying Muay Thai. She holds a blue belt in jiu-jitsu under Chris Brennan and is the former undefeated Pillow Fight Champion of the World. Dimitri: Looks like a Guns N' Roses T-shirt. Not really representative of a gangster. The skull is nicely executed, but the boney fingers beside the skull are hard to make out. Compositionally, I like how the focus is on the skull, but the rest is lost in the sidelines. “American Gangster” is barely visible; it could benefit from a touch of color. Suzanne: Summoning Axl Rose from the dead, TapOut’s skeletal logo is frightfully simple. Sonnen is the self-proclaimed "American Gangster," therefore the nationalistic skeleton does make sense and the symmetrical composition is aesthetically pleasing, but it lacks directness and verve. Sam: They've really pushed the maximum printable area on T-shirts these days. There is so much detail here! 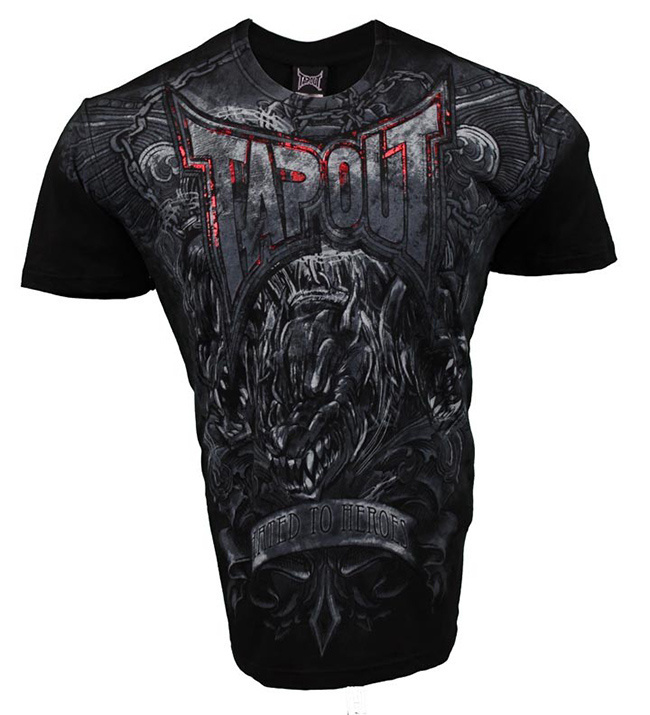 Underneath the Tapout logo, there's a viscous demon dog of some sort in the middle, but I can't really make out what's around it. I see teeth, chains, and lines and ... just stuff. The text at the bottom says, “Hated to Heroes." It’s a bit hard to read. Dimitri: Greys with a hint of hell's flames just around the corner, behind this Cerberus-like creature. It could be scary if it weren't such a mush of grey. With a bit more attention to composition this shirt could be fierce. I do like the stoney armor look of it. It reminds me a bit of Count Dracula's armor in Bram Stocker's Dracula--the red armor with the muscly fibers. The way "TapOut" is displayed on the chest is good, too. Strong. Despite this, the whole design is a little too undecipherable and depressing. It doesn't make me feel so good. Suzanne: The gray scale in this T is impressive in its understated simplicity. The articulation of the ferocious hell-dog, for the "The Pitbull" Alves, is striking. Yet the text distracts from the drawing. The motto “Hated to Heroes” is weak, lacking the formidable power that Alves is known for. It is not as powerful as that devastating flying knee he delivered to Matt Hughes, therefore it should be omitted as not to exhaust the overall message. The image can stand alone to instill fear and assert authority. 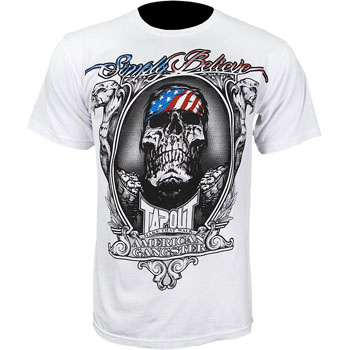 Sam: I’ve noticed many MMA tees feature skulls and bones. I've always wondered what the mentality is. I guess they are saying they're prepared to die in the ring, or something like that. Anyway, I like this shirt. Not too cluttered. The skeleton works well with the Mexican theme on multiple levels. Yes, it's badass and all that, but it can also be a tribute to Mexico's most famous holiday, The Day of the Dead. Dmitri: I'm a fan of this simple, Day of the Dead-inspired design. It effectively transmits Velasquez's origins and culture in a stereotypical and humorous way, especially since, I'm guessing, MMA fighters are not allowed to bring guns in the ring. “Affliction”? Not the best choice but a somewhat appropriate word in these circumstances. Suzanne: Referencing the vast history of Mexican art and cinema, Velasquez’s patriotic mustachioed skeleton marries Day of the Dead iconography with the infamous character of the violent gunslinger. It is a virtual celebration. As Day of the Dead characters focus on familial epitaphs, this article of clothing commemorates the strength and richness of his parents’ native country. I don’t think that we are going to see this image represented in the Museo Nacional de Antropologíor Labor contemporary art gallery any time soon, but it is one of the more successful walkout T-shirts. Sam: Some might say the art is inspired by Game of Thrones, but I think it's more like a Dungeons & Dragons Handbook from the 70s. The dude, presumably Josh Barnett, has a giant hammer, which is kind of Alistair Overeem’s old gimmick. 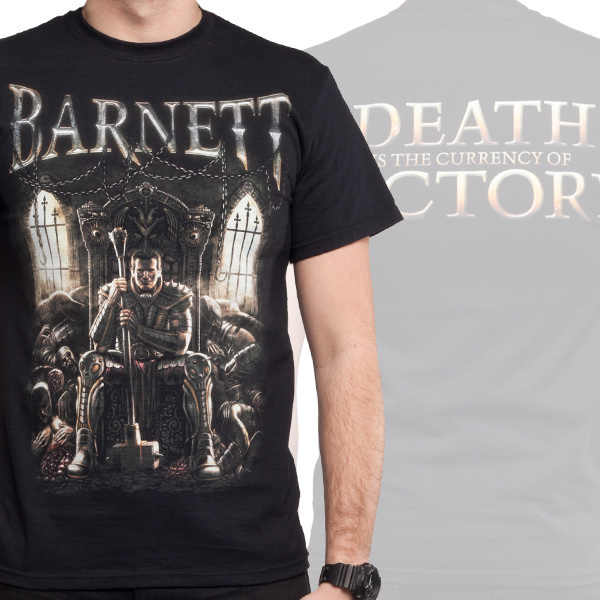 Does the back say, "Death is the Currency of Victory?" That would never work in court. Dimitri: This shirt has potential, but the armored man represented has no emotional depth, like an early days motion-captured 3D animation character. It lacks something of the emotional reality of what an MMA fight is like. This is fantasy, video game, Warhammer stuff. A little childish. Suzanne: The video game graphics on this are out of control. Leave bad digital animations to the gamers. Sam: Whoa! I like this. I like the graphic shapes on this shirt. I love screen-print feel and limited colors. 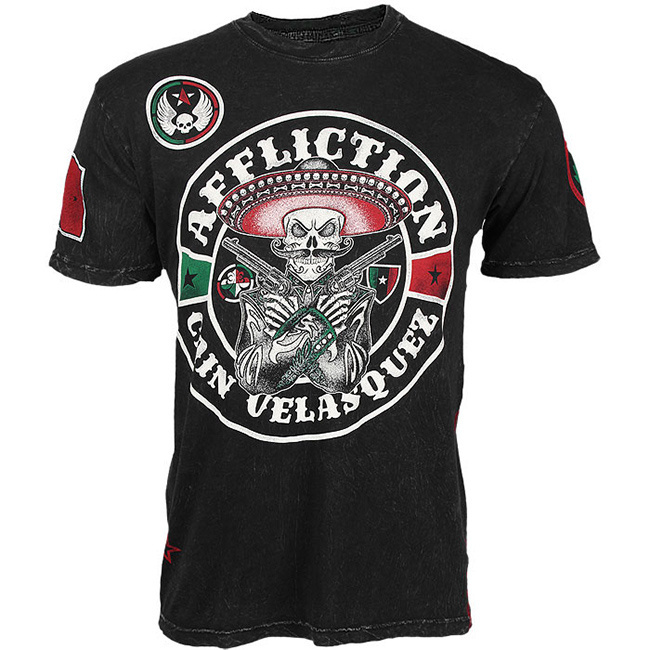 I haven't seen many MMA fighter tees with this style. Good job incorporating Cub's tattoo in the design. Dimitri: This shirt has some symbolic aspects to it that I find fascinating. Metaphysical in its composition, I'm full of wonder at the meaning of each visual element. The palm trees, tall and strong, able to resist hurricane winds. The bear--it looks like a grizzly--also a definite symbol of strength, but why is it hanging out with the palm trees on the beach? The colors could be the subject of a whole essay in and of themselves in order to work through the complex reasoning behind their choices. Their unconscious influence must have science behind it. Perhaps they are meant to disorient and instill fear in the adversary? As they battle, the question must arise in the back of their mind: “Why were the moon and the stars pink on that shirt?” Next thing they know ... Wham! A moment of distraction can be deadly in the ring. 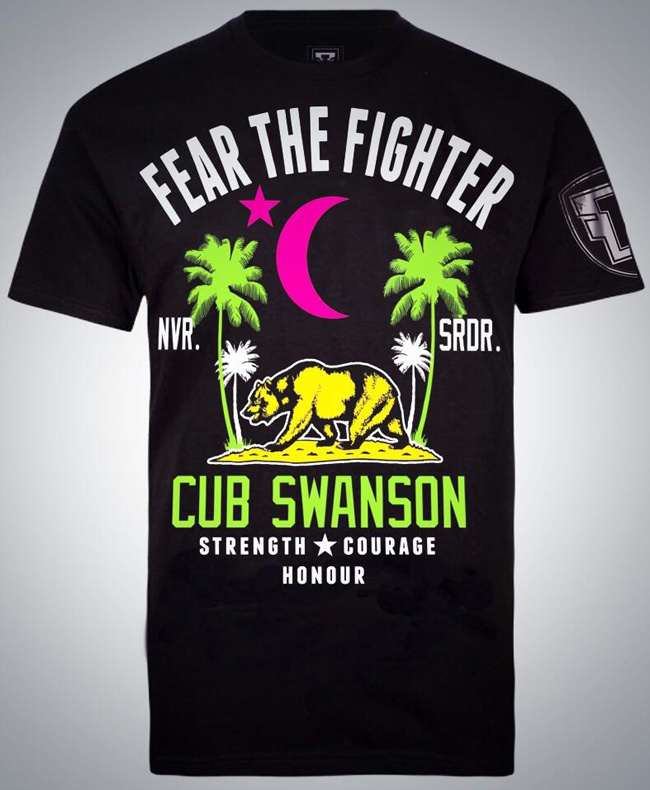 Suzanne: The bright colors pop against the black background, but Cub Swanson’s logo looks like a record label from the seventies. That being said, it is juxtaposed with a reference to the Muslim world through the addition of the crescent moon and the star. I am uncertain if it is poor cultural appropriation of the Middle Eastern emblems or if it is a true evocation. Sam: Gothic, skulls, snakes, swords, and clutter. I'm not a fan of these. I like the two-tone, symmetrical idea, but I would still never wear this. Dimitri: Red, grungy, skulls, snakes, an iron cross: a little boring and predictable. I like the monochrome. The shirt itself looks well-cut and comfortable, and the design probably complements the shapes of the body that fits inside it. Suzanne: The only thing extreme about this shirt is the horror vacui. Seriously, where am I looking? There is far too much going on in this shirt. Overbearing prints do not allow the eye to rest on any one image and it ends up looking messy and chaotic. Über-baroque. Sam: Here's a fun fact: This is a depiction of the Biblical badass Samson killing a lion. For those who don't remember, he was the most badass fighter with the seemingly supernatural strength: a good role model for the modern MMA fan, Samson only cared about smiting his enemies and getting booty. Oh yeah, he also killed a freaking lion with his bare hands. I love the line work. I'm not sure who the artist is, but it's from the late 1800s. Dimitri: Definite bonus points for originality here. A good break from the heavy metal influence of a lot of the other shirts out there. Succeeds in representing strength and courage with a traditional, deep-seated cultural reference (Hercules slaying the Nemean lion). The drawing reads well, also unlike a lot of the other shirts. Suzanne: This is a favorite. 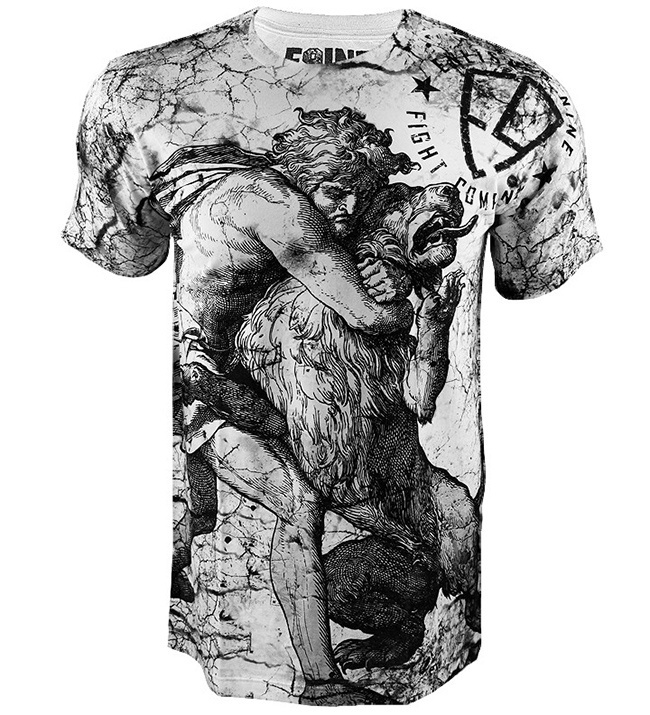 Breathing new life into an ancient Roman tale, this submission T-shirt boldly encapsulates the strength and beauty of classic sculpture. A marble Roman gladiator comes to life on the fabric of this garment in opulent Hellenistic glory. Referencing the Borghese Gladiator at the Louvre, the brave warrior captures the bear-like god in a rear-naked choke, submitting the creature.